While India is the world’s sixth wealthiest country with a private wealth of $8,230 billion, arch-rival Pakistan leads the worst performing wealth markets’ table for 2016-17, said a report. India topped the “Best Performing Wealth Markets” with a growth of 25 percent to $8.23 trillion and the global wealth rose by 12 percent in 2017 up from $192 trillion at 2016 end to $215 trillion at the 2017 end, according to AfrAsia Bank Global Wealth Migration Review 2018. Pakistan showed a decline of 10 percent annually in 2017 along with Nigeria becoming two of the worst performers in 2016-17. Safety concerns and stock market declines have deterred investment in Pakistan which resulted in it becoming the worst performer in 2016-17. 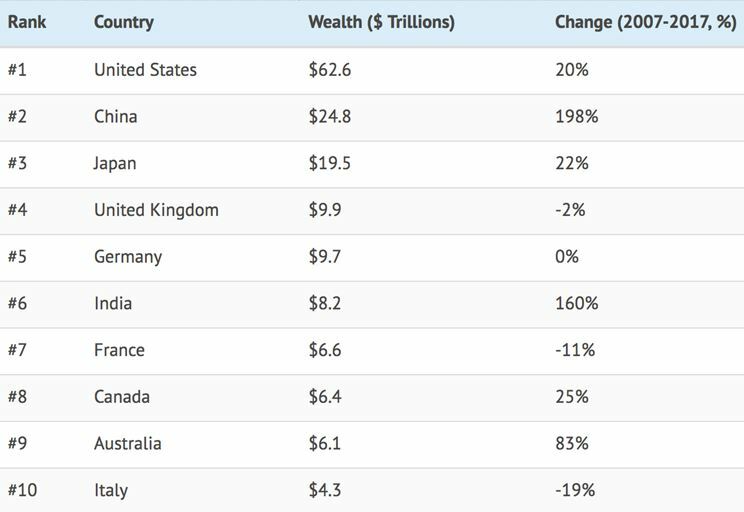 The wealthiest country in the world is the US, with a total wealth of $62,584 billion, followed by China with $24,803 billion at the second place and Japan with $19,522 billion at the third place. The others in the top 10 list include the at Fourth position UK with $9,919 billion, Fifth position Germany with $9,660 billion, Sixth position India with $8,230 billion, Seventh position Australia with $6,142 billion, Eighth position Canada with $6,393 billion, Ninth position France ($6,649 billion) and tenth position Italy ($ 4,276 billion). According to the report, the total wealth is referred to the private wealth that is held by all the individuals living in each nation. The total wealth definition includes all their assets including property, cash, equities, business interests less any liabilities. The report doesn’t include government funds from the calculated figures. The larger countries with higher populations hold an advantage in the report. Incredibly, the vast majority of this wealth – about 73.5% – is held by just 10 countries. While the ranking order of the top three wealthiest countries will remain the same, India is expected to shoot up 200% to claim the #4 position with $24.7 trillion in private wealth. Factors that will help in wealth creation in India include the large number of entrepreneurs, good educational system, a robust outlook for information technology, business process outsourcing, real estate, healthcare, and media sectors which will result in a 200 percent rise 10-year wealth growth forecasted , according to the report. 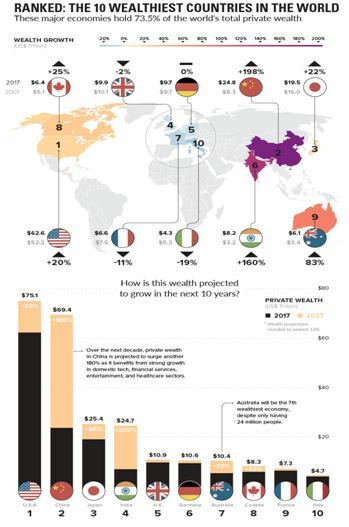 In the coming decade, China is expected to witness a significant rise in total wealth to $69,449 billion by 2027, while the wealth of the U.S. would be around $75,101 billion. France will continue its descent down the ranking to 9th place with just 10% growth in a decade, and Australia will increase wealth at a rate that is very impressive for a developed economy. 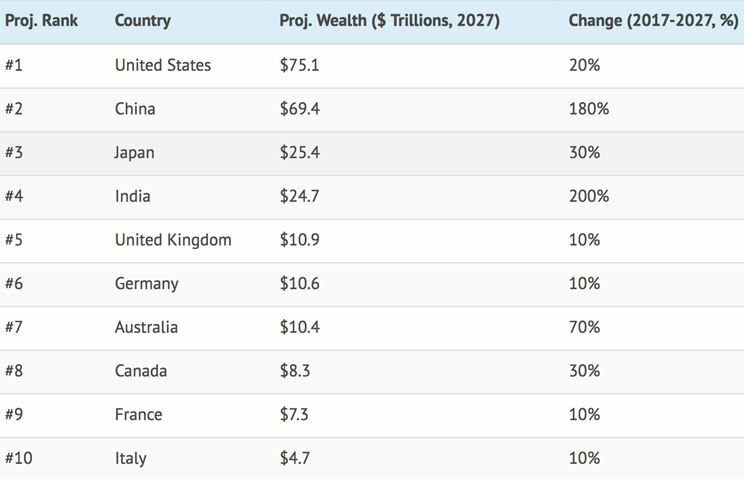 By 2027, it’s expected to be the world’s seventh richest country in terms of private wealth, with a total of $10.4 trillion. That will rival powerhouses like Germany and the United Kingdom, each with private wealth near the $11 trillion mark. Globally, the total private wealth held worldwide amounts to around $215 trillion and there are around 15.2 million high net-worth individuals in the world, each with net assets of $1 million or more. The report added that there are about 5,84,000 multi-millionaires in the world, each with net assets of $10 million or more and 2,252 billionaires in the world, each with net assets of $1 billion or more. Over the next 10 years, Australia is expected to overtake Canada and gain significant ground on Germany and the U.K. While, India will overtake Germany and the U.K. to become the fourth largest wealth market worldwide by 2027. Global wealth is expected to rise by 50 percent over the next decade, reaching $321 trillion by 2027. The fastest growing wealth markets are expected to be Sri Lanka, India, Vietnam, China, and Mauritius, the report said. Upsurge in religious extremism- Is Pakistan racing to become a theocratic state?